POPULAR reinsman Ken Rogers continues to enjoy the crest of a wave. Driving in sensational touch, Rogers captured four of the seven races at Victor Harbor today to complete his second quartet in as many weeks. 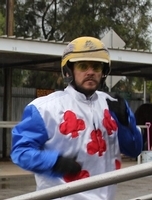 A fortnight ago Rogers made four trips to the winners’ circle at Globe Derby. “It was a good day,” Rogers said. “I felt like I had a strong card of drives and it was good to see it turn out that way. “It was also the first time I have managed to bookend a meeting, which is something I have wanted to do. Rogers opened his account by partnering the Les Harding-trained Crystal Sparkles to a narrow victory. Leading throughout from barrier two, the daughter of Rocknroll Hanover staved off a late challenge from Canada Bay to score by a half-neck, with Calcavado nine metres away third in 1:58.9 over 1660 metres. Rogers then scored with Regal Knight which caused a minor upset when he accounted for Steinman and Major Rainbow. The Shane Loone-trained gelding registered his first win since last July by rating 1:59 over 2160 metres. Rogers completed a treble when he made his debut for Victorian horsewoman Emma Stewart. Partnering well-bred youngster Celebrity Chef, Rogers was content to occupy the ‘death seat’ on his way to a four-metre win from Star Corka, with Belladonna Girl a head away third. Taking her record to two wins from three starts, the daughter of Heston Blue Chip rated 1:59.1 over 1660 metres. “It was my first time driving for Emma and I’m glad I got the job done,” Rogers said. Combining with Harding again, Rogers led throughout with Just Makemine Diamonds, which proved too good for Hilltopsomewhere and For The Corz. An Australian Pacing Gold purchase, Just Makemine Diamonds extended her record to five wins and six placings from 16 starts by rating 2:00.6 over 2160 metres.